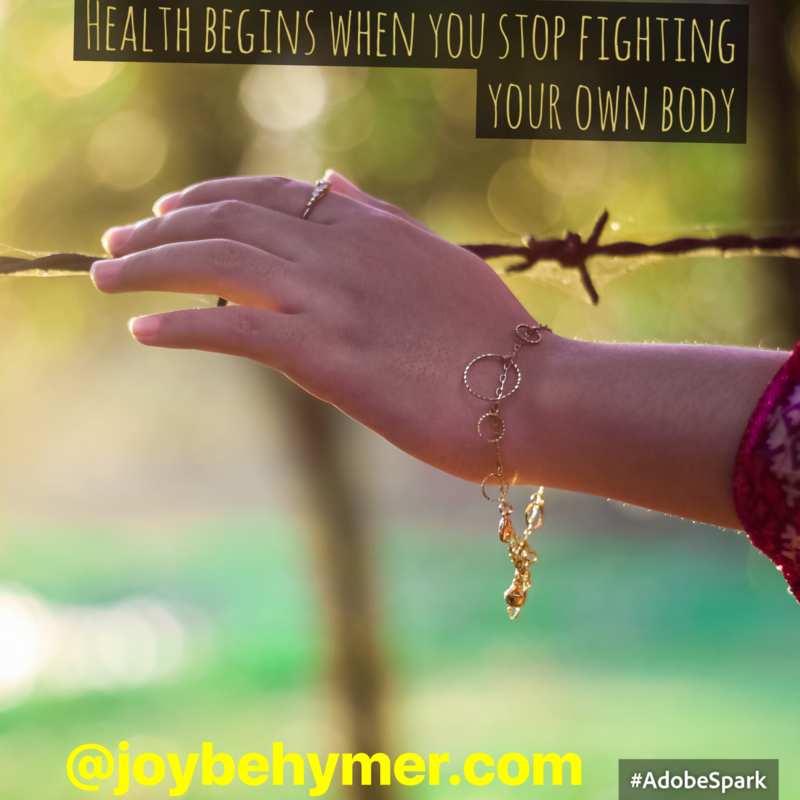 One simple thing I think we often miss is that our improved health begins when we stop fighting our bodies. Every day our bodies are constantly striving to obtain the best alignment and health it possibly can. Our cells are always creating a homeostatic environment and striving to balance our systems collectively. While you are talking, while you’re sleeping, while you’re engaging in your daily activities, and even when you may be complaining, your body is moving behind the scenes. Think about it. How many times a day do you remind your heart to beat every minute? How often do you ask your lungs to exchange the air you need to breathe? When you touch something, do you ask your nervous system to feel for you every time? We can take a lot for granted that is constantly happening for us. While you have your amazing body functioning on your behalf each and every day, how are you treating it in return? Do you care and respect it as much as you would your family, home, or even work? Do you put it last? Often we trade our cars, homes, and jobs when we need an upgrade. We can’t do that with our bodies. We may improve them, but I haven’t found a store where you get the full trade. From the way we speak to ourselves (remember our cells are always listening) to the way we take care of it and give it rest and nutrition, our body works with what we put into it. Perhaps when we step back and feel gratitude for all that is going on internally on our behalf, we can inspire better care of ourselves. You don’t have to reroute your entire life to do it. There are times that your health may call for extreme health care during a crisis, but I’m talking about the things you can do each day. Those steps in self care magnetize to better health. Being patient with yourself is a good start. Giving your body water more often enables your cells and organs to do so much more on your behalf. Giving it some movement, and also balancing it out with ample amounts of rest and sleep. There is a time for both in optimal health. One of the biggest things I see from clients is the need to set more healthy boundaries on stress. If you are being pulled in too many directions in life that prevent you from rest and self care, I highly recommend a re-evaluation of your life. It’s very healthy to do from time to time. Especially since not all commitments are meant to be for a lifetime. It may be only of use in seasons. Like life, our needs and balance change. You may be on the spectrum of walking away from some things and you may be on the spectrum to get out a little more and pick up some new things. We can easily get out of whack on both sides. The investment in time towards your health can be of great reward. Especially if you yearn a long healthy life. You can enjoy your loved ones more. You can engage in the things that bring you passion easier when you feel well. Just as you would tend to your child, elderly parent, a pet, and even plants, you deserve as much attention as you give to others. Many people think that if they care well for themselves they are being selfish and taking away from others. I found it to be the exact opposite. The better you care for yourself, the better you feel, and the better you are to others. You actually seem to crave wellness for others when you feel well. So…take that time for yourself. Get a massage, take a nap, go to bed a little earlier, drink more water, try some yoga, make a few minutes for silence or meditation, go on a nature walk, or think grateful and loving thoughts towards yourself. Be creative and simply ask your body what it needs. It’s always communicating with us; we just often aren’t listening. And spend more time learning to listen to your body. I’ve found it to be people’s best guru. One of the biggest things I’ve learned about creativity is that you really can’t force things if they aren’t ready. I have weekly writing goals and luckily have a wonderful writing coach that helps my needs in improvement and accountability. It helps me in my flow. My goals generally work really well for me. Like life, it can get a little off balance and at times need a bit of rearranging. Mostly they fit easily in my life. With all that said, even with “goals” set forth, I find there are times and days that the tap isn’t flowing for me. When you write or create often, you can get out of balance. When this happens, I’ve found we can help move that stagnant energy by refilling ourselves. Refilling ourselves helps with inspiration and blocks. I’m very busy outside of my writing practice running my own businesses, taking care of my family, my pets, and my variety of daily activities. I’m always checking in with my balance scales to be more aware and perhaps a little better. Refilling my “tank” helps me to juggle the many things going on daily. There are times that I have the opportunity and atmosphere set up and ready to write and not much is flowing. The more I try to force it, it truly eludes me even more. I’ve learned to not get so frustrated and take it as a sign for a little refueling. I have found many little tidbits to help me balance. At times I only briefly walk away and the flow comes right back. I may read some current topics, listen to an inspiring YouTube video or lecture, and I also love to catch up on TED talks (I’m going to suggest checking out TED talks if you’re not familiar with them already as I think these are great for hope and inspiration). Even a short break can get the juices flowing. When I have days where I originally planned plenty of time for my writing and it doesn’t flow much that day, I see it as a blessed opportunity to break and focus my energy elsewhere. I have a list of books I look forward to reading and I may pick one up to take a break from my own head. I also recognize that when you have busyness in your life, a day or two of self care to refuel certainly helps responsibilities, work, and people in your life. When you feel a little stuck, not flowing, or perhaps fatigued in some of your activities, consider redirecting your focus to gain some clarity, insight, or inspiration. It can be big or small. There will be times and opportunities for both. If and when you can swing the opportunity do some self care days, jump on it! It could be a massage, a trip to the salon, or some sort of service that makes your soul joyful and your mind relaxed. On days you do not have those bigger opportunities, you can implement small things. It could be a favorite book, a funny movie, a walk, a little yoga, a soulful chat with a friend, or anything you can do that uplifts you a bit. When we try to force our flow or energy, we often don’t get far past our frustration. 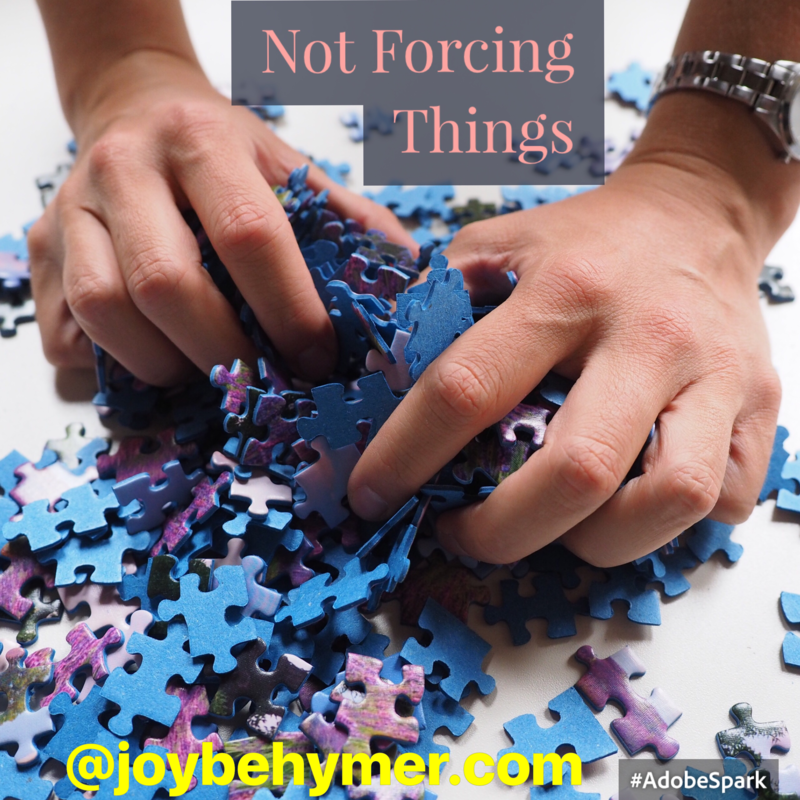 Trying to force things doesn’t feel inspired and we aren’t moving so much from the soul. Have you ever noticed when you are excited about a project, that it just flows? Now think about how it feels when you try to force or make something happen. I know my gut isn’t comfortable when I try to force action. The action ends up feeling empty or incomplete. Mainly it feels like I put a lot of work and energy in and didn’t make it very far.. When you can be mindful in how you feel while you are creating or doing a project, you can steer the energy to serve you better. If it feels like you are forcing it, take it as a sign for a beautiful break. Declare you are allowing some space for divine ideas and inspiration. Redirect your energy and simply go do something else. See if you find some relief. If we can get away from insisting things always flow our way, we can allow space for more powerful energy that can serve you much better. You may even tap into a more magnificent flow! I was listening to an interview between Oprah and Tony Robbins. He stated “If you don’t have ten minutes in the morning to prime yourself, you don’t have a life.” This really rang a bell for me. How often I have heard that people don’t have any time for themselves. Through the years, I’ve had the privilege of listening to my client’s thoughts and struggles when they come for their massage therapy. I’m often asked about health, happiness, and how to feel one’s best. I get to explore ideas, suggest tools, and share experiences that I have learned from as well. I find that small tips are more applicable for everyday life. While there can be much good to come from large long term goals, I have found that the small steps we can implement each day make the large impact we are looking for. I believe it happens a little over time. Each day that we choose a little better for ourselves, we experience the shifts of positive change. One of the biggest impacts I have experienced and heard often from many other teachers is how they start their day. You may assume they meditate for hours every morning. And though this may be an ideal you are aiming for, I find that most of them spend a small amount of time priming and grounding themselves for the day. This is something you can do. For just ten to fifteen minutes each morning when your eyes and ears are awake, you can take a few minutes to tune yourself to a calm and peaceful place before going about your day. Especially if you generally have busy and hectic days. I like to think of it as putting your armor on before you leave your house. Or perhaps just prepare ahead of time for your daily interactions. When you prime yourself first thing in the morning, you have more footing in how you deal with your family, co-workers, and those you come into contact with each day. Regardless of what you do daily, you can still choose your vibrational set point before each day begins. There are no rules of course as to what may work for you. We all have different lifestyles and what you can implement in your reality. I have cats that wait on me each morning to open my eyes to feed them. I love my animals, but I have to admit it makes starting my day a little tricky. I’m guessing that many of you have living beings to work around such as children, spouse, and family. Add your daily responsibilities and it’s easy for us to not take that ten to fifteen minutes in the morning for ourselves. It’s easy to want to get a jump start when we have a lot on our plates every day. If you aren’t in a position to rearrange some of these demands, you can at least take a few minutes for some deep breathing and perhaps just to be grateful in that space. As soon as I awaken, I kind of of lay there and pretend I’m not awake in my attempt to trick my cats for a little more time to myself. Before my feet hit the floor, I take a few minutes to think of everything I possibly can to be grateful for. It starts my day in a more positive place, and I strongly feel it buys me much more patience with my animals, my spouse, and my daughter. When I can peacefully and calmly take a few minutes to prime or ground myself, I find life to flow more gentler and easier for me. As I am walking around the house preparing the animals’ food, my vitamins, coffee, and so on, I will continue in my head to focus on all the blessings around me. I really start simple. I think about how grateful I am to have food, electricity, a home, a comfortable bed, appliances, technology, and many amenities that make my life easier. The fact that I don’t have to start my day like people did 100 years ago can certainly be given credit to how spoiled we are today. The more I can look around and think about what I am grateful for, the more I feel centered, calm, and appreciative. That vibration reverberates to my family, my home, and on to my job. 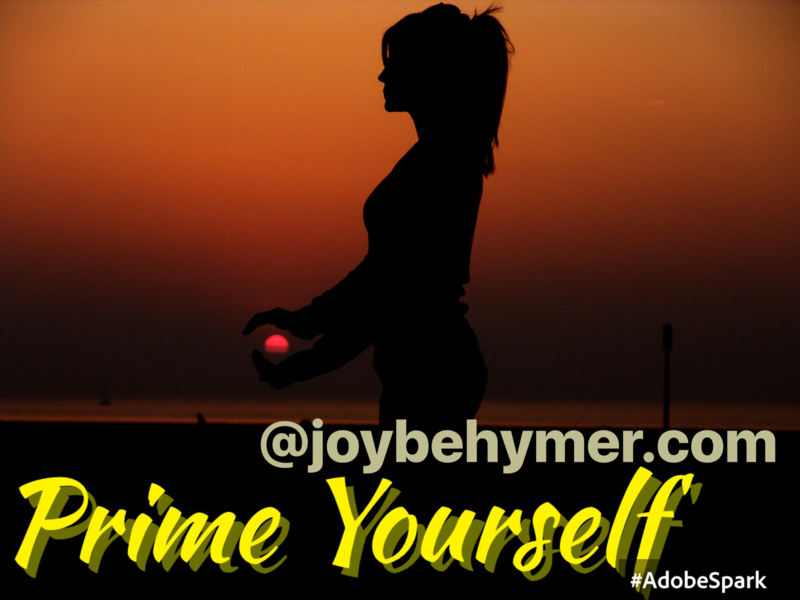 When you are priming yourself, you are filling your tank up not only to interact with others, but also to emit an energy into the universe. If you cannot find ten minutes in your morning, you may simply not be making it a priority. Think about what Tony said… “If you don’t have ten minutes in the morning you don’t have a life.” I like to think more that you don’t have much creative and centered control of your life when you do not take the time for any priming. You are basically moving in your autopilot mode. Now if you feel your life is better than you can imagine, perhaps your autopilot is right where it needs to be. I just often hear from others how chaotic, busy, and stressed their lives are currently flowing. To cut back on some of this chaos, you can set aside ten minutes for a practice that works nicely for you to start your day. And perhaps you need to get the kids out the door to create that time, but the priority is doing something. Practice it for a month and just see where it takes you. Be aware if things shift and especially what you notice. Sometimes our own life shows us what we need to see. We often look outside for advice from others when it’s standing right from within. I hope to inspire you not to give all your power away to busyness or chaos in each day. Give yourself back ten minutes and see what it buys you. Ten minutes is not only a reasonable start, but I think a necessary one for more joyful peace of mind. 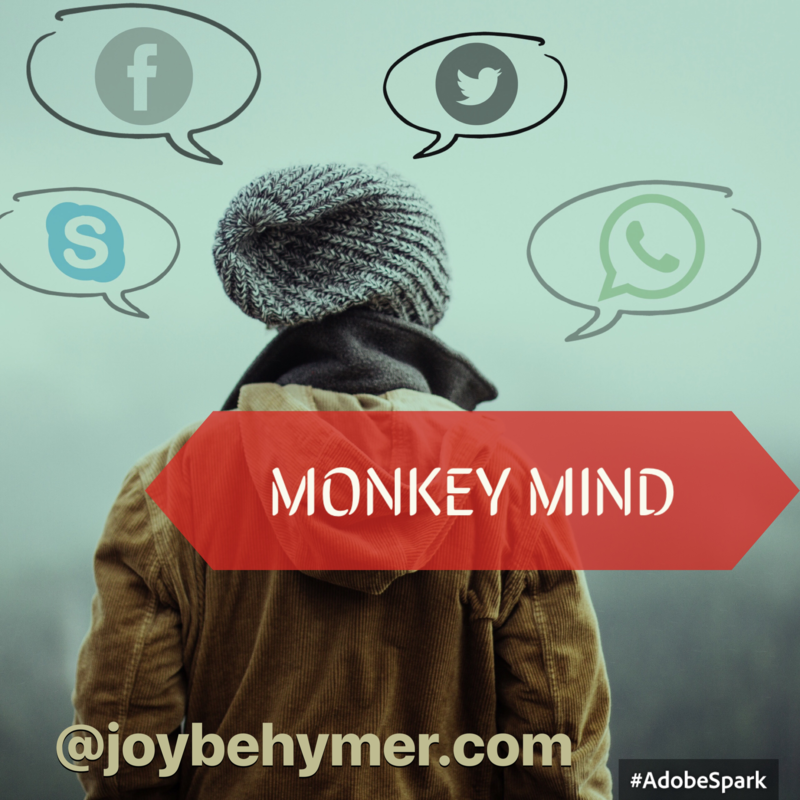 One of the biggest struggles many of us seem to have in common is dealing with our monkey mind. It’s the 50 million thoughts constantly competing for our attention. Our ego gets really good at distracting us from peace and relaxation, especially when we have practiced many troubling or worrisome thoughts for a long time. Overthinking can cause stress, unnecessary worry, and regrets. When we occupy much of our time replaying the past and worrying about the future, we can miss the peace in the present. Often meditation teachers offer tools on how to slow down the monkey mind. For some, sitting still in silence can be tough for a beginner. Until you have practiced ways to quiet the mind, you can easily get frustrated with your monkey mind. It can take a little time to let go and simply observe your thoughts without entering a conversation with yourself with each one. I often hear from clients how challenging sitting in meditation and quieting their mind is for them. The cool thing to know is that there are so many avenues to quiet the mind other than sitting in silence. Sitting in silence is very beneficial, but I’ve learned you certainly don’t have to beat yourself up because you haven’t mastered it. What works well for one, may not flow for the next. I find with myself that I turn to many different tools to help my own monkey mind. Sitting in meditation doesn’t happen every day. Often I find that place of peace when I’m in my practice of writing. I also change up what I’m doing depending on how I’m feeling that day. I also can slow down my monkey mind when I am engaged in painting, pottery, walking, yoga, and simply being in nature. You can implement walking meditation if you need some movement in slowing down your mind. There are no rules in what works for you. Give yourself permission and space to try a few things out that resonate with you. For some it may be a quiet cup of coffee on their porch. Perhaps it’s baking or a round of golf. The key is getting lost in what you’re doing. When you focus on things you enjoy, you can find yourself more present and learn to take a break from the 50 million thoughts running through your mind each day. The more you practice, the better you get! Eventually you may even find yourself with the ability to sit in silence and meditation longer. The idea is to work your way into quieting the monkey mind. When you do stumble on activities that slow down your thinking and bring you relief, those are going to be the things you want to hone in on initially. Staying with those things may be enough for you, but if you are seeking a deeper connection with yourself and hearing that inner voice, keep at it. That is the key we often leave behind. When things don’t happen for us fast enough, we often drop it and accept that it doesn’t work when perhaps you didn’t give it enough time or patience. I believe that, given time, “can’t” is often replaced with “can.” It may take quite a while, but all things can be possible. When you can slow down your monkey mind, you can create the space to focus on what brings you peace and joy. I highly encourage you to frequently find time to quiet your mind. Not only can it bring you more peace, but it often helps enhance the things you do in daily life. You can approach situations from a calmer and more grounded place when you feel clearer and more balanced. Slowing down many of our distracting thoughts helps us focus more clearly.